Newport Polo's lesson program will introduce polo students to a string of polo ponies that regularly play in the Newport International Polo Series. These ponies are thoroughbred horses that have been trained to play polo, and can adapt to each player's level of skill, from beginner to advanced. Romeo originally came to Newport Polo as a stallion from the racetrack. 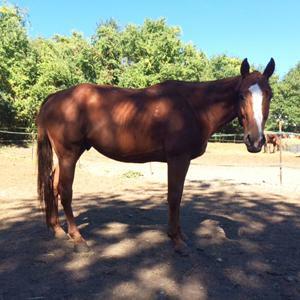 He's a chestnut thoroughbred gelding with a white blaze, white feet and a white 'slap' on his right cheek! He still flirts shamelessly. Pepper came from a Pennsylvania racetrack 4 years ago and has never looked back. She is now in her prime as a polo pony, and loves her new career! She is single and enjoys meeting international teams, and her favorite things are sweet feed and hay by the moonlight. She has been distinguished as Best Playing Pony several times. 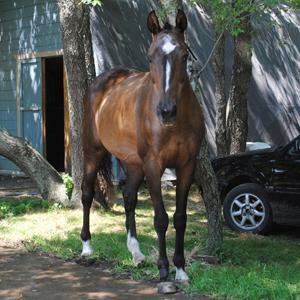 This SWF is a bay thoroughbred mare with a white star. Sugar came off the track in 2011 from Suffolk Downs. She is our smallest pony, requiring a 51 mallet, and until this year, the youngest in the herd. She is a gray thoroughbred mare, co-starring in our 2011 Christmas card. We almost lost her during her 1st summer due to a stubborn abdominal impaction, leaving her on the brink of despair. With a lot of TLC, we hand fed her back to robust health today. Sugar has made rapid progress learning the game, playing her first competitive season in 2012. She's a favorite of our best players and students. This bay thoroughbred mare's career has been a story of comebacks. Unsuccessful on the track, she was deemed 'un-rideable'. She sustained a broken leg that took 2 years of patience to overcome. She has subsequently been named Best Playing Pony more than any other horse in the club. Her name, those fleet white feet & blaze, and human eyes are instantly recognized by players internationally. Ginger has taught most of the Newport Polo Club's members to play the game of kings. She herself is nothing less than a queen, not only as an alpha mare of the herd but also on the polo field, showing great heart and competitive spirit. Ginger has long mastered the game of polo, and though a female of her vintage never discusses age, she is nearing the end of her playing seasons but one would never know it by the way she still plays. Our big pony with a strange name hails from, you guessed it, Texas! Originally trained by Harry Houdini in the art of escape, this clever bay mare with white star carries her devious intelligence out onto the polo field as well and requires seasoned riders for a thrilling game of polochess. In her prime years for polo now, she's fast and fun. 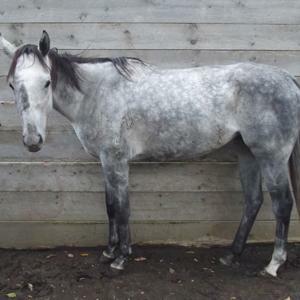 This dappled grey thoroughbred mare posted wins in her racing career before retiring to a life of polo a year ago. Spending more time in the air than on the ground, the name Pegasus befell her. A few threats of sending her down to rodeo, coupled with loads of patience brought her 'round. Her curious nature and eagerness for attention boosted her progress, for a brilliant breakout into chukkers by the end of last year's grass season! A minor injury led to some time off, and she will resume her training this spring when we expect to see her advance rapidly. 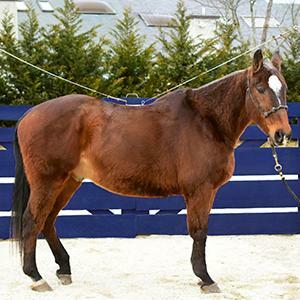 Missy is our jet brown thoroughbred southern belle, who journeyed north from Florida's high goal polo league last spring and has been a solid addition to the Saturday matches as well as lessons ever since her arrival. She's a quick turner with plenty of get-up-and-go! Negrita is one of the quickest studies that we’ve come across among racehorses that retire from the track and are given the chance at a new career in polo. This dark brown thoroughbred was not only noteworthy in her physical development at an early age, but she also learned to play polo within 9 months. Now in her 2nd season of competitive polo, she is favored by new students as well as accomplished players for her calm nature and easy manner. Miss Large-and-in-Charge, Coca won her 1st 'Best Playing Pony' title in 2014, playing for Scotland. 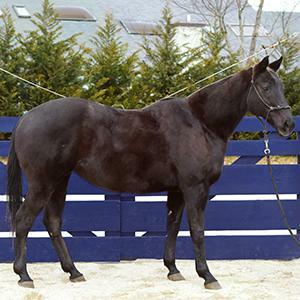 This bay thoroughbred is a former racehorse from Suffolk Downs, and coming into her prime as a polo pony. 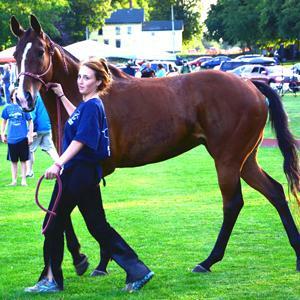 Arnold (pronounced with an Austrian accent), a 6-year-old chestnut gelding joined Newport Polo after racing at Suffolk Downs, is mixing it up with the veteran string. All who ride him say, "I'll be back"! Zoillo is a popular choice among our students. Little do they know, this bay thoroughbred gelding from Argentina had a polo career in England in prestigious events including the Queen's Cup, and Gold Cup, along with playing in the French Deauville circuit before coming to the US. He debuted in the Newport International Polo Series in 2013 and became known for his easy handling and speed. Even though he's an international horse of mystery, Zoillo still stays true to his Argentine roots with a classic Gaucho name meaning 'Life'.